Here's the latest post in my festive series, it's the gift guide for men. 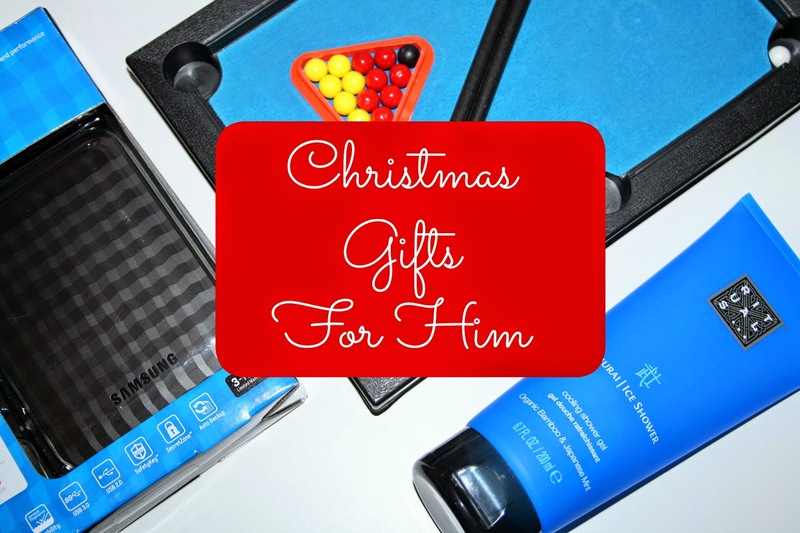 I think men are tricky to buy for so I thought i'd put together a few gift ideas. First up, I thought i'd include this Samsung hardrive, my dad has a hard drive already but it's really hold and doesn't have that much memory, this Samsung one has 1tb of storage and its really lightweight and portable. Next up, who doesn't love some luxurious bath and shower products, this Rituals shower gel smells amazing, it's designed to cool the skin so it's great for men who need a cool down after work or a session at the gym. Another Rituals product is this moisturiser, I always get my dad a moisturiser as it's something he wouldn't bother buying himself. It adds hydration to the skin and lasts up to 24 hours, its lightweight so soaks in really fast. My dad has asked for a bottle of Paco Rabanne 1 million aftershave this year, it's very rare that my dad will specifically ask for something, I picked this up over the Black Friday weekend, it was a bargain at £36 for the 100ml bottle. The Champneys sports therapy is a lovely giftset to give this christmas, Again the products are ideal for men who don't buy themselves skincare products. Inside theres a facewash and a moisturiser. I got my dad this Phillips wet or dry shaver earlier in the year, it might actually have been last christmas. It was on offer, I think it was like half price! I think every dad or husband needs a shaver. They are so easy to use and so quick, great for when men just want a quick fix. A fun little gift for any mans stocking is this desktop pool game, it's a fun addition to the office/ workplace. It's only a fiver so you could even get it for a secret santa gift or just as a little extra gift for someone.